Sivalingam Arunthathi returned to their previous living place in Madukkulam in Vavuniya district in 2011. At the time of resettlement she together with her family faced many difficulties to re-commence the means of livelihoods. In 2015, she got membership in a community based organization named; Federation for Integrated Rural Management (FIRM) a district bound organization. FIRM being one of the partner institutions associated with RAHAMA had received a credit fund through REEDCo in order to assist poor who could not access for lending through institutions or Banks. Objective of this wholesale lending was to enhance livelihoods of the poor. 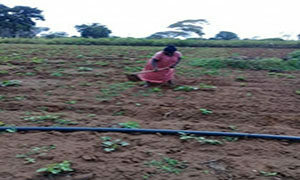 Accordingly, she got a loan of Rs 25,000 through FIRM and started Onion cultivation with the support of her spouse. This endeavor helped her to invest some money to buy a Goat as well. 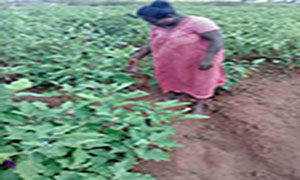 She could repay the loan within the agreed duration and could obtain Second loan of Rs 50,000 in early 2018 and extended her cultivation with other crops such as Ground-nut, Pumpkin, Brinjal, Beans and Chillie. Through the income she derived through farming she manage to buy two milking cows too. At present, she is getting regular income while also continuing regular savings. She expresses her gratitude to FIRM organization, Div. Secretary in Vavuniya and RAHAMA and the Donors for the support given to them to enhance their living standards. ← How Microfinance adds value to ascertain a bright future.